The all-hands meeting in corporate life is no one's favorite venue as a speaker. Rarely is it about giving everyone a car and a year off; more often, it's an effort to deliver and explain bad news, or to start fixing a company-wide problem. And so it was for the ride-sharing behemoth Uber in June. Beset by problems that ranged from sexual harassment accusations to cities revoking its licenses, the company had commissioned an independent report that gave it numerous prescriptions for fixing its sexist culture, and the June meeting was meant to address those with employees. Huffington: There's a lot of data that shows that when there's one woman on the board it's much more likely there will be a second woman on the board. Bonderman: Actually, what it shows is that it's much more likely to be more talking. Huffington: Ohhh. Come on, David. People in the room were "aghast," according to one report. Mansplaining often begins with just such an interruption, and the myth that women talk too much is a centuries-old trope used to shut women up--after all, if you're told you talk too much, that's a typical response. The comments were leaked almost immediately, and Bonderman later apologized and then resigned from the board. At Uber, for example, more “talking” would be an uncontestable good. A lack of communication is a major reason the company has wound up in a public crisis. From its founding, the dysfunctional start-up had poorly articulated policies and provided little supervision and few ways for workers to take their concerns up the food chain. Former employee Susan J. Fowler had to turn to a public blog to report sexual harassment. Perhaps more dialogue in the early stages would have compelled Uber’s executives to recognize all that and adopt standard business best practices — things as basic as requiring receipts for reimbursement and as major as not turning a blind eye to harassment by “high-performing” employees — years ago. Having more women on its board in the earlier days (Huffington joined only last year) might have led the company to address the sexism in its culture before it spiraled out of control. What can you learn from this famous, interrupted speech? Make clear sexist comments are not acceptable: Huffington might have done more, but in the moment--who was expecting a sexist remark at a meeting on sexism?--her rebuke at least made clear that the view was one a dinosaur might hold, and not appropriate. Remember that your presence and voice are essential, no matter how outnumbered you may be as a woman. 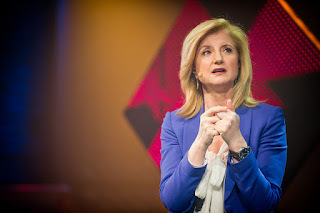 Both in this more public meeting and many private ones, Huffington was the lone female voice battling the culture. Imagine this meeting had there been no female board member. Audiences don't like sexist treatment of women speakers. Guess what? Here's another case where the audience objected immediately (and probably leaked audio of the exchange that fast, too). Audiences have helped back up beleaguered women speakers a lot this year, and I like that trend. Leaked audio from the meeting is here, and the relevant part begins at the 6:40 mark.